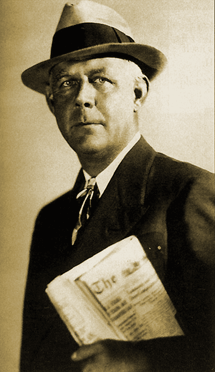 Grantland Rice was one of America's greatest and most widely read columnists of the first half of the 20th Century. Alongside Ring Lardner, Damon Runyon and Paul Gallico, 'Granny' Rice was one of a handful of influential sportswriters who translated the sporting events of the 1st half of the 20th Century to millions of America's sports fans and non-sports fans alike. Going beyond the print media, Rice began broadcasting over Radio with the 1930s Coca-Cola Top Notchers. 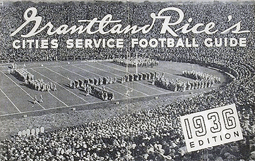 Over the course of the next twenty-five years Grantland Rice appeared in over 2000 Radio programs, mostly sports interview programs. Between 1921 and 1948 Rice produced a series of over 200 sports shorts for film. 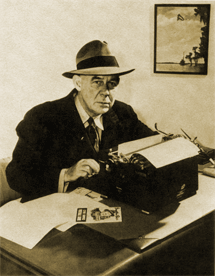 Rice, already one of America's foremost sportswriters was famous for coining the name, The Four Horsemen, in referring to Notre Dame's famous 1924 backfield of Stuhldreher, Miller, Crowley and Layden. Rice also wrote a great deal of verse, mostly centered around sports, but expanding to all manner of topics. Rice was also famous for the oft cited credo, it's "not that you won or lost, but how you played the game." Another timeless example was his observation that, "A wise man makes his own decisions, an ignorant man follows the public opinion." During his over 50 yrs as a sportswriter and social commentator, Grantland Rice interviewed virtually every significant sports figure of the era. He wrote of Bobby Jones, the golfer, that he was unquestionably the finest golfer to ever play the game: "There is no more chance that golf will give the world another Jones than there is that literature will produce another Shakespeare." Tiger Woods, notwithstanding, that observation has held up remarkably well over the subsequent 80 years. 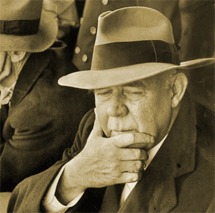 Grantland Rice's poetry was an even more enduring legacy of his remarkable career. Rice's 'Game Called' was adapted from prose he'd originally penned in 1910, but in 1948, he updated the passage to honor Babe Ruth's passing"
"Game Called by darkness  let the curtain fall. Game Called  and silence settles on the plain. Where is the crash of ash against the sphere? That once brought joy to every waiting ear? Forever waiting for the flaming spark. Game Called  what more is there for us to say? Has waved his cap to bid us all good-bye. 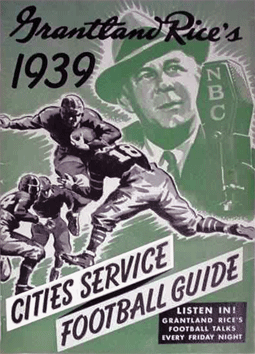 Grantland Rice was by no means a newcomer to 1940s Radio. 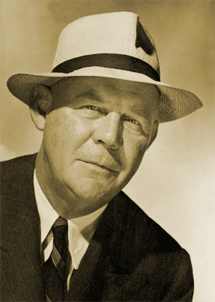 Beginning with 1930s Coca-Cola Top-Notchers, Grantland Rice had become as much of a fixture over Radio as he'd become in print media and Film. Along with Red Barber, Frank Graham, Bill Stern and Graham McNamee, Grantland Rice was one of a handful of Radio voices that were immediately associated with Sport. By then in his 60s, Rice was already working on his autobiography, The Tumult and The Shouting, when he was approached by NBC to narrate a series of half-hour sports stories which had become his favorites over his extraordinary career. Co-produced by NBC's Garnet Garrison and Rice's son, Herbert, the series showcased some of the greatest popular sports authors in American history. 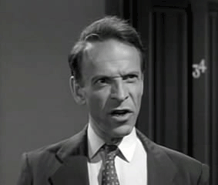 As the series evolved, it became apparent that Ring Lardner, James Thurber, Charles E. Van Loan and Frank Graham were particular favorites. Culled from many of the popular magazines of the era, the stories sparkled with poignancy, humor and self-deprecation. Sport had become as much a business as Radio by the mid-1940s, but it hadn't grown so large that it couldn't stand some light-hearted self-reflection. The series' selections also showcased several highly inspirational stories from the world of Sport. This was, after all, the World War II era. Indeed, midway through the series D-Day announced to America and the world that the United States was prepared to stand by it's founding principles after all. 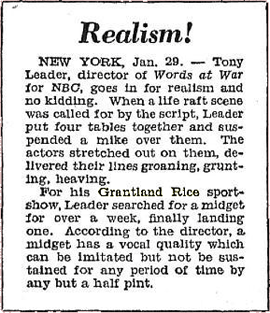 As a consequence, several of the stories Rice selected after D-Day had a decidedly patriotic slant, as did most of the contemporary programming of the time. 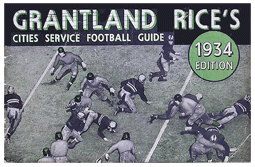 The format was quite clever and informal, and suited Grantland Rice to a tee. 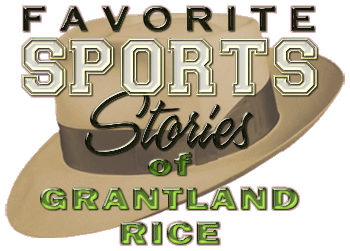 Set in the mythical Sportsman's Club, Grantland Rice held court with a group of other sportwriters at a weekly Saturday meeting to chew the fat and spin sports yarns. 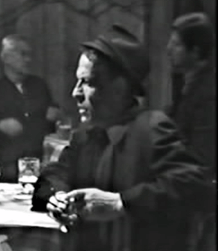 With a rare few exceptions, Rice presided over every recorded broadcast of the run. After a brief intro, the open mike would record contemporary sports-related observations of the era in the background until one or more of the members of the group would pose a question to 'Granny.' Upon answering the question or providing his opinion on the topic, Rice would segue into his story selection for the day. The story from that point forward would be dramatized by the cast of East Coast actors and, upon the dramatization's end, Grantland Rice and the boys would comment on the story selection followed by an occasional teaser or announcement of the next week's story. The casts comprised most of the better East Coast voice talent of the day: Ed Jerome, Stefan Schnabel, Josephy Wiseman, Lon Clark, Bill Quinn, Elspeth Eric, Norman Lloyd, Leslie Woods, Jim and Henny Backus, Jim Boles, Stacy Harris, Peggy Allenby, Larry Haines, Owen Jordan, Joseph Julian, Helen Choate, Joe De Santis, Barbara Fuller, Frank Lovejoy and Mason Adams to name but a few. Sustained for the duration of the series, NBC clearly spared little expense mounting a superb cast to support these fascinating sports stories. 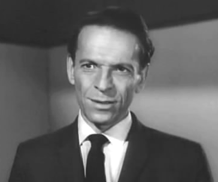 Anton M. Leader directed the majority of the productions backed up by Paul Martin. 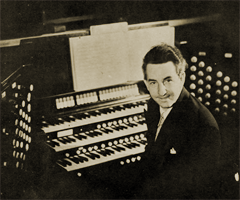 Ben Kagan adapted or wrote most of the script treatments backed up by Gerald Holland and T.W. Ford. 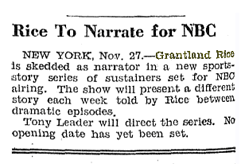 All top-notch NBC Radio men, Grantland Rice was well-supported at every level during the production run. As with much of the better Radio of the era, the stories hold up quite well even today. The sporting achievements of the first half of the 20th century, though infrequently marred by an occasional gambling scandal, were untarnished by performance-enhancing drugs, million dollar salaries, and billion dollar media contracts. The sportswriters of the era intimately knew most of the teams they covered. The players and athletes they covered almost always came from humble or middle-income families. Both the athletes and sportwriters called things they way they saw them, warts and all. But the enduring themes, irrespective of the humble language they employed, were the focus. Men--and women--against the record books. Personal accounts of athletes overcoming the tempations of success and fortune to take time out for Uncle Sam. They were predominantly simple men and women blessed with a few physical gifts that transported them to the heights--and depressions--of sports fame or disappointment. Every bit in the spirit of Grantland Rice's famous poetic expression, it's "not that you won or lost, but how you played the game." Run Dates(s)/ Time(s): 43-12-11 to 45-05-05; NBC [WEAF]; Sixty-three, 30-minute programs; Sunday afternoon or morning. 2. Contrived only to increase the file size(s) and thus make any downloads or byte-for-byte trades of--or for--the canon half again larger than the original recording--all other encoding details being equal. Announces "This is March 4th"
2:45-WEAF-Football: Illinois vs. Notre Dame, at Champaign, Ill. Announces "Saturday Morning, November 11th"
Announces "'So long for the Summer"
NEW YORK (AP) -- "Outlined against the blue-gray October sky, the Four Horsemen rode again." Perhaps there will be better leads written on sports stories, but there probably will never be a more widely known one. It was written almost three decades ago in describing the Army - Notre Dame football game of 1924 by Grantland Rice, the dean of American sports writers, who died of a stroke last night at 73. Notre Dame went on to win the game on that murky day and the famous backfield of Elmer Layden, Harry Stuldreher, Jim Crowley and Don Miller became a legend. Rice was a perfectionist of his profession and many is the youngster who tried to pattern himself after this veteran of more than a half-century in sports. Granny, as he was known in the trade, was one of the first erudite sports writers. When he started, after his graduation from Vanderbilt University with a Phi Beta Kappa key, sports departments as they are known today, were non-existent. In fact, his first job with the Nashville News in 1901 combined covering sports with the state capital, county court house and customs office--at $5 a week. "But how you played the game." He had several books of verse published including one on the first world war in collaboration with Brig. Gen. Theodore Roosevelt Jr. He served in the Army during World War I and was commissioned a first lieutenant. He was sent to France and was transferred to the Army newspaper, Stars and Stripes, then was made a liaison officer. Rice's opinions were widely sought and he never could decide whether Babe Ruth or Ty Cobb was the greatest athlete he ever watched. He was certain that his greatest thrill was watching Ruth point to the flagpole in Wrigley Field then hitting the ball to that exact spot for a home run, during the 1932 world series. He said the Dempsey-Firpo fight of 1923 was the greatest fight he ever saw and that Bobby Jones' grand slam of 1930 was his biggest golf thrill. Jones, who was one of Rice's closest friends, said "his death is the worst news I have heard in years." In addition to the Nashville News, Rice worked on Forester Magazine, the Atlanta Journal, the Cleveland News, the Nashville Tennesseean, the New York Evening Mail, the New York Herald Tribune and the Bell Syndicate which distributed his column at the time of his death. He is survived by his widow, Katherine, whom he married in 1906, and a daughter, Mrs. Fred Butler of Venice, Calif. Professionally she is Florence Rice of the movies and stage. Rice was born in Murfreesboro, Tenn., on Nov. 1, 1880.